While we were in Gulf Shores we went to eat with my nannie and her husband mark. they live near the beach and we always go by their house and eat dinner when we are at the beach. mark is a fisherman and always fries us up some fish and nannie makes the fixings to go along with the fish. it was so good and it is always good to see her. i treasure the time i and the kids get to spend with her. after dinner we took the kids to the trak to ride go carts and other rides. they came with us to watch them... i know they enjoyed watching them and we enjoyed seeing them as well! 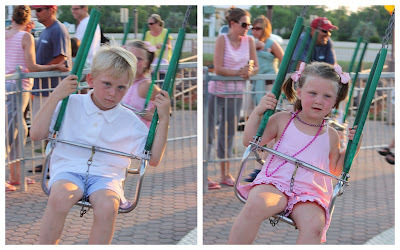 riding the swings... check out jackson's face... he is "too big for the swings"... look at his face... he was so bored the whole time he was riding it... every time he would come around we would cheer for him and he would get so mad... brylee on the other hand LOVED it! 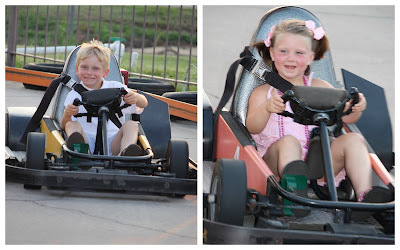 this is more their speed... jackson LOVED being able to drive by himself and brylee was your typical female driver... she loved running into people and running into the wall... she would just laugh the whole time. we also rode the bumper boats... jackson loved it and was all into getting wet and squirting other people and getting sprayed... he was SOAKED when he got done... i rode with brylee (while wearing a skirt... not easy) but she DOESNT like to get wet in her clothes... so needless to say we stayed away from the crowd and she would scream at anyone who tried to squirt us... since she was "freaking out" we cut out ride short and got out. 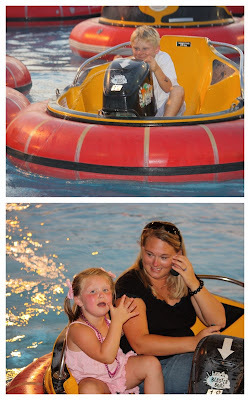 Like the guy at the ride told her... it is a water ride you are going to get wet!